In this episode, now that we know the Digital World is its own living entity, it's now under investigation for enticing a young child. There are surprises that have thematic significance, deep ramifications or marketing tie-ins. Others fall into the the category of “why the hell not?” With the party already divided and only one of the groups making any progress, there are enough problems to be worked out to occupy another episode or two before the impending bombshell. Adding a development like this could be viewed as clutter, an afterthought of a partnership to spotlight a character that does not need to be spotlighted. At the same time, it's done in entertaining fashion, aware of how ridiculous the concept is and having some fun with it. And it's so damn cute too! Let's be honest with ourselves about Suzie here: she doesn't need to be pushed into prominence like this. She'd be just fine as this season's Jun Motomiya, showing up from time to time to make Terriermon's life hell and holding no real significance to the plot. 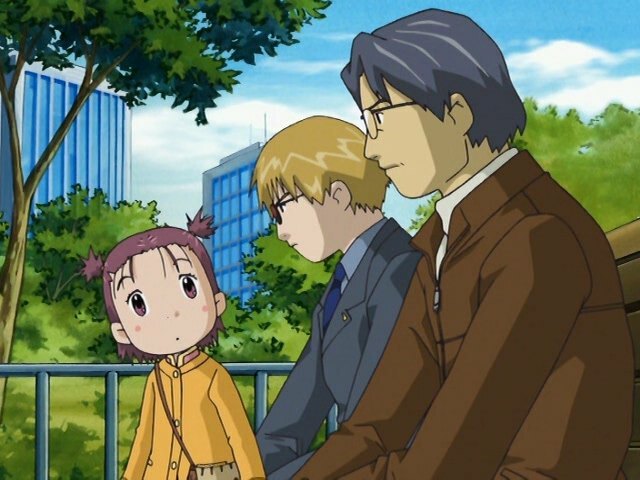 Tamers is squarely focused on the three primary characters and their partners, so new additions like Kazu and Suzie are inevitably marginalized by the end of the story. The biggest discussion point regarding Suzie going to the Digital World comes from Yamaki. 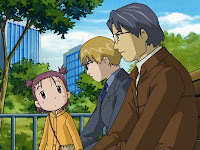 After witnessing her disappearance, Yamaki says that her youthful imagination was a bigger factor than her connection to Janyuu and Henry. This is debatable, as it was Suzie's desire to see Terriermon that ultimately pushed her across, but it is the only explanation for the digital field appearing. What's troublesome about this is that although Suzie clearly has an active imagination and uses it a bunch in playing with her dolls (or Terriermon), all little kids do that! Nothing suggests that she is any more imaginative than your average seven-year-old child. In fact, without Terriermon around, she's been downright bored, to the point where she has to blackmail Janyuu into taking her to the playground. Which is hilarious, by the way. What it boils down to is that the Digital World itself plucked a normal little girl out of the real world, in hopes of realizing ideas out of her imagination. The implications of this are frightening, as this could conceivably happen to anyone. Anybody wonder how Ai and Mako became tamers? There's a definite Alice in Wonderland vibe when Suzie arrives in the Digital World. She wanders around, experiencing some of the oddities of the place, most of which harbor a silent desire to hurt her. 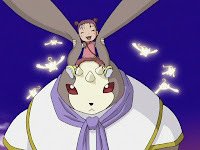 The Tapirmon she chases has a distinct white rabbit feel about him as well. It's not long before she gets fed up with the place and wants to go home. But first, she pays a visit to the March Hare. Each of the Devas has a distinctive personality, so it's not hard to accept Antylamon as being less committed to her work. As doorman to the land of the Sovereign, she was never supposed to see much action. Given how she's swift, lanky and not at all suited for guard duty (someone like Indramon would be much more appropriate), it was probably an intentional move. I can buy that she's not interested in destroying a human like Suzie on sight. What I can't buy is that Suzie can pester her to the point that she'd commit treason. Years of devoted service being undone because of a smile from a human? The species the Devas are at war with, and bred to hate? As a benevolent neutral, Leomon getting bugged into submission's fair, but this? This is stretching it. But hey, it's one less Deva to fight. I could be wrong, but I think this is the first time we actually hear Mrs. Wong talk. Even though he ultimately allows Suzie to get sucked into another world, seeing Janyuu do some parental work with someone other than Henry is fun. Janyuu describes Shibumi as being interested in “playing God.” Again, Shibumi's a Lain character, so the description does not violation the separation of church and dub. The digicode under Suzie's landing spot in the Digital World reads Zhuqiaomon. I had to translate this one myself! Suzie does a good job illustrating the “perception trumping reality” nature when she isn't hungry until she starts talking about food.